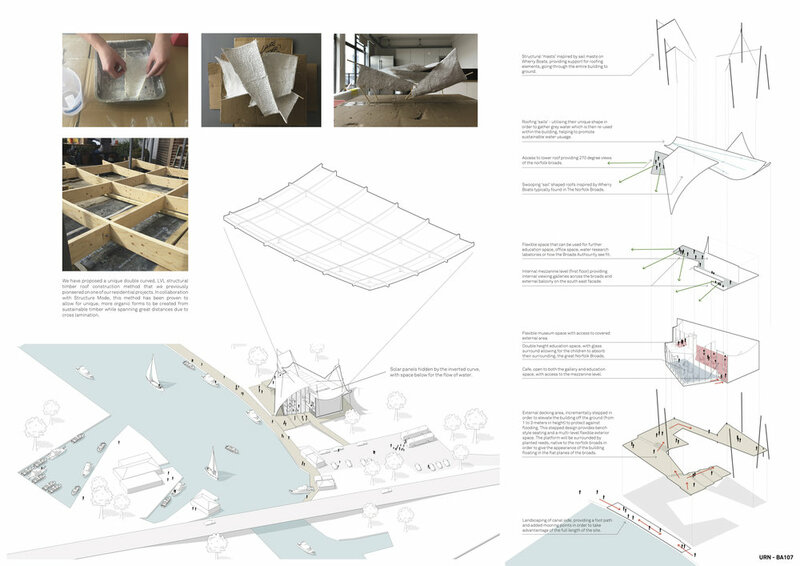 We recently entered into a competition to design the new visitor's centre at Acle Bridge, in the Norfolk Broads. We were given the task of designing a canal side visitor centre that provided cafe space, facilities for mooring boats, an education space and an exhibition area in order to educate visitors about the history of the Norfolk Broads and the importance of water. The building was also to be designed in order to take advantage of the surrounding landscape, the largest protected wet land in the UK. investigation using craft rock to create organic 'sail like' shapes. We were then able to establish numerous roofing schemes that we could use in the design of our building. How we developed an innovative roof construction method! In 2014 we were given the exciting opportunity to design a replacement for a dilapidated, unused and unloved glass conservatory in East London. In this we saw the opportunity to experiment and develop an innovative timber roofing system. The result, a self reciprocating, double curved timber roof with a stressed skin. A unique roof was created unlike any in the surrounding area, floating above a beautiful space which is flooded with natural daylight everyday no matter the time of year. After we had the idea for our new roofing system, we modelled it completely down to every nut and bolt on BIM. This allowed us to collaborate with structural engineers to ensure the rigidity of our proposed design. From our BIM model we were then able to extract each timber beam's outline for our test model. As our excitement increased about our idea becoming a reality we decided that we wanted to build a little version to keep in our office for ourselves. We produced a scaled laser cut model of the roofing structure - which not only looked cool but helped settle our nerves about it fitting together. Effectively we had designed a timber jigsaw on a building scale. Physical model complete, it was now time for the real thing! After final structural checks, we exported our template for the timber beams and sent it over to Finland. We had decided that the best construction material would be Kerto-Q Structural LVL (Laminated Veneer Lumber) from Metsa Wood in Finland. The reason we decided on this was due to its exceptional structural performance. This super strength comes from its cross lamination, with each layer going in a different direction, meaning that when cut into curved beams the structural strength is in no way comprised. The below image shows how each sheet of LVL was cut using a CNC machine forming our individual pieces, with millimetre accuracy. It was then a waiting game for our timber to arrive in London! STEP 4 - Timber Arrives! After a quick few weeks the wait was over and our oversized jigsaw pieces were in London! We began the trouble free, seamless operation of slotting ever piece together forming our double curved timber latice that served as the roofs 'structural bones'. Each element was bolted together, spreading the load across the entire roof, then down to the foundations through the steel support columns. Of course we had to go to site in order to see this process happen, we couldn't miss it! After the roof structure was assembled it was then lifted into to place, floating on thin steel columns and then made water tight with slithers of glass between the roof and the minimal side walls. The result, an innovative roof curving up graciously towards the sky. Not only an architectural showpiece in East London but also an engineering triumph. We were thrilled with our design but not as excited as the clients were to gain an extra room in their house. They were able to enjoy their garden all year round and fall back in love with their home. While great on the inside the unique extension also looks fantastic for passers by, especially once the sun has set and the building glows from within. Planning permission granted for new build house in National Park! MW Architects have gained planning permission for a contemporary replacement 180 Sqm dwelling in the historic village of Alfriston, South Downs National Park.